Do you want to heal yourself and others and Mother Earth? Do you want to usher in new higher vibrations of love, light and freedom that enable a glorious ascension? If your answer to both these questions is yes, then Magnified Healing® is the course for you – a full 2 day workshop that involves 14 hours of teaching. About Magnified Healing® : An ancient healing modality was introduced to Earth in 1983. 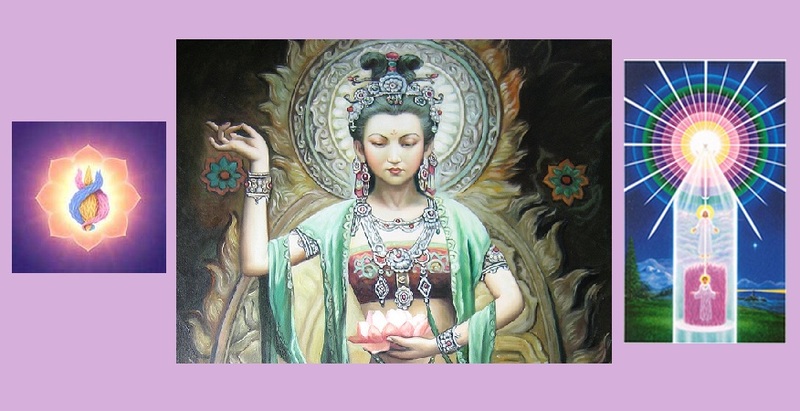 In 1992, under the direct intervention and inspiration of Lady Master Kwan Yin, Magnified Healing® of the GOD MOST HIGH OF THE UNIVERSE was brought forth into its expanded form for the spiritual advancement of Humanity and the Earth. Many forms of healing are ‘healer focused’, meaning that the seeker must go to a physician, priest, temple, shaman or other place to receive healing. In most vibrational healing methods, the healing is channeled and directed through the healer. In Magnified Healing® the practitioner creates the energy with GOD MOST HIGH OF THE UNIVERSE and IT becomes Magnified Healing. It is a Total Empowerment. Prerequisites: A knowledge and understanding of basic metaphysical terms such as karma, spiritual centers (chakras), Spiritual Hierarchy, Threefold Flame, Violet Fire, Ascension. The Internet and spiritual books are excellent resources to learn about these concepts. The official Magnified Healing® teaching manual is given to the students at the beginning of the workshop. At the end of the second day, you will receive the Initiation, the official MH certificate prepared and signed by your teacher and one bottle of Essence. Certification as Master-Teacher of Magnified Healing®. After 11 days of continuous practice one can practice and teach across the world. The balance amount is to be paid during the workshop. Kindly confirm your seat at the earliest, since bookings will close as soon as 8 seats are filled up. Workshop Facilitator: This workshop will be conducted by Preeti Bedi from Bangalore, who is a Reiki Master and a 3rd phase certified Master Teacher of Magnified Healing®. She is also a practitioner of various other natural healing modalities and can be contacted directly on 9880814521 and preetibedi@hotmail.com for any further info. Dress Code: White or light colored clothes. Please avoid non-veg food, alcohol and nicotine before a day prior and during the workshop days.